"We now have a new generation who can enjoy what a family means." Prior to World War II, Chinese workers in the United States were not allowed to become American citizens. In addition, they could not bring their wives and families along with them to this new land. While their husbands tried to support them in America, the women remained in China and acted similar to grieving widows. Meanwhile, the men grew accustomed to their situation and surprisingly seemed to accept it as a way of life. In one brief and effective scene from Eat a Bowl of Tea, an excited older man enters the room of a local prostitute. When he exits the room, he's shocked to see virtually the entire adult male population waiting in line at the same doorway. This fairly charming picture depicts the period following the end of World War II when the United States opened their ranks to Chinese immigrants. American citizenship was a possibility, and the families could move over from their homeland. Ben Loy (Russell Wong) is a carefree guy spending his time having fun like a typical young man of his age. In accordance with his father Wah Gay's (Victor Wong) wishes, Ben returns to China to participate in an arranged marriage. When the local matchmaker determines that his horoscope matches that of Mei Oi (Cora Miao), they return to America as newlyweds. While this type of quick wedding varies considerably from Western standards, it does at least allow the couple to live together in the same country. When Ben receives a prime job as the manager of a popular restaurant, everything seems great for the new family. The early moments of this story are engaging and represent the particular innocence of youth and the American dream. The young, attractive couple seems poised for success in the booming post-war economy. Unfortunately, Ben's new job requires much more time than one might expect, and the relationship with Mei Oi grows very tense. In addition, the entire community appears to be watching their every move and waiting for a baby to arrive. When the child is not forthcoming, the elderly men wonder about Ben's abilities in the bedroom. Is the pressure just too much for him to handle? A trip to Washington D.C. provides a brief respite for the couple, but the problems continue to increase upon their return to New York. Meanwhile, Wah Gay continues to pressure his son with his own ideas for a successful relationship. The original innocence looks to disappear completely, and possible infidelity could doom the marriage to a quick ending. Director Wayne Wang (The Joy Luck Club, Smoke) again brings a refreshing and original tone to the interesting material. Unfortunately, the compelling premise never plays out and instead reverts to typical dramatic events. Although Russell Wong is a bit stiff in the lead role, the acting is generally pretty solid across the cast. The tale flows quickly through its 100-minute running time, but it never moves beyond the level of mildly entertaining material. The plot wavers more towards bland matters and loses some of its earlier attraction. The overall experience is generally worthwhile, but it only partially succeeds in reaching its original promise. Image Transfer Review: Eat a Bowl of Tea offers a 1.85:1 anamorphic widescreen transfer that provides an effective viewing experience. The picture deftly conveys the atmosphere of Chinatown in the late '40s, and virtually zero distractions appear on the screen. The amount of grain remains pretty low, and the defects are extremely minor. My only complaint is that the colors could have a bit sharper, and the clarity level could be slightly improved. On an overall scale, however, this transfer provides a solid presentation. Audio Transfer Review: This disc features an acceptable 2.0-channel Dolby Surround transfer that meets the usual expectations for this type of release. The dialogue is understandable and reaches the proper volume level, which works for this talk-heavy story. Nothing stands out as being overly remarkable with the audio track, but it does showcase Mark Adler's score effectively. The sounds remain fairly centralized, but everything is adequate enough to meet the expected quality. Extras Review: The only extra features on this disc are bonus trailers for Maid in Manhattan, The Road Home, and The Vertical Ray of the Sun. All three previews appear in effective widescreen transfers and utilize 2.0-channel stereo sound. 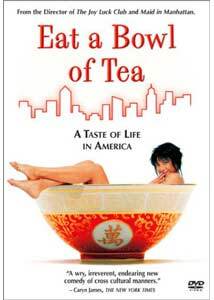 Based on a novel by Louis Chu, Eat a Bowl of Tea begins with history never revealed to me in high school history classes about America's discrimination against Chinese immigrants. The prologue is especially intriguing and reveals the promise of a remarkable film. Unfortunately, this tale reverts to the typical dramatic moments and is only partially successful in executing them. The result is an good time-waster but much less than my initial expectations.